Crater Lake lies in a basin, or caldera, formed by collapse of the Cascade volcano known as Mount Mazama during a violent, climactic eruption about 7,700 years ago. This event dramatically changed the character of the volcano so that many potential types of future events have no precedent there. This potentially active volcanic center is contained within Crater Lake National Park, visited by 500,000 people per year, and is adjacent to the main transportation corridor east of the Cascade Range. Because a lake is now present within the most likely site of future volcanic activity, many of the hazards at Crater Lake are different from those at most other Cascade volcanoes. Also significant are many faults near Crater Lake that clearly have been active in the recent past. These faults, and historic seismicity, indicate that damaging earthquakes can occur there in the future. 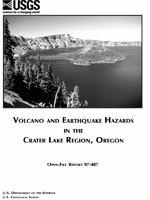 This report describes the various types of volcano and earthquake hazards in the Crater Lake area, estimates of the likelihood of future events, recommendations for mitigation, and a map of hazard zones. Bacon, C.R., Mastin, L.G., Scott, K.M., and Nathenson, Manuel, 1997, Volcano and earthquake hazards in the Crater Lake region, Oregon: U.S. Geological Survey Open-File Report 97–487, 32 p., 1 plate, scale 1:100,000, https://pubs.usgs.gov/of/1997/0487/.